StreamingTime has, without a doubt, been developed for those who love music. The add-on is advertised as a useful piece of software that enables users to listen to thousands of free online radio stations for free. It claims that it will make it very easy to find online radio stations playing one’s favorite songs as well. A user simply needs to type stream in the URL bar, press TAB (or Space) on the keyboard, and then enter an artists’ or a particular song’s name. It sounds very easy, but we suspect you could find radio stations playing your favorite songs using an ordinary search provider as well, so we cannot confirm that StreamingTime is very useful. Researchers at 411-spyware.com have quite a negative opinion about this piece of software too because it has turned out that it alters Google Chrome settings once installed on the system. In other words, it acts as a browser hijacker. If you have found the undesirable changes applied to your web browser as well, you will need to remove StreamingTime to undo them. It is not some kind of extremely sophisticated malware, so the removal of the browser extension responsible for the changes applied will definitely be an effective solution to the problem. 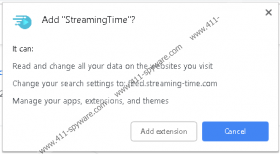 StreamingTime has been classified as a browser hijacker not without reason. Research has shown that this piece of software immediately changes the default search provider on the user’s Google Chrome browser once installed on the system. After its successful installation, you will see https://feed.streaming-time.com open automatically when you launch your browser. This page will be set as your new default search provider. Judging from the visits to this page, the majority of users who have encountered this browser hijacker live in the United States, China, and South Africa, so we suspect that this browser hijacker is spread the most actively in these countries too. Of course, it does not mean that you cannot encounter it if you live in a different country because StreamingTime can be downloaded from its official website and the Chrome Web Store by anyone. More reliable applications that allow performing music searches exist, so you should ask yourself whether you really want to find your default search provider altered before you click the Download button to get StreamingTime. https://feed.streaming-time.com is not a malicious website, but if you use it to perform your web searches, some modified search results might be displayed to you. These modified search results are not considered to be malicious, but we cannot let you click on them freely as well because they might take you to suspicious websites. There are many of untrustworthy websites on the web, and you might find yourself on any of them after clicking on the modified search result whose only goal is to drive traffic to that website. Unfortunately, it is not that easy to recognize sponsored search results, so it is very important to use a fully reliable search provider to perform web searches. Unfortunately, we cannot confirm that the search tool set by the StreamingTime browser extension is one of them. What about the StreamingTime distribution? Some users download it from its official website https://streaming-time.com/, whereas others consciously install the extension from the Chrome Web Store (https://chrome.google.com/webstore/detail/streamingtime/befmofeikcemiffcjbnphelmcamaommo). Some other Internet users find this piece of software installed on their computers out of the blue, which suggests that it might be spread in a different way as well. The most commonly used alternative distribution method is called bundling. If you have recently installed new software downloaded from the web, StreamingTime could have been presented to you as an additional offer you have agreed to without even knowing that. To prevent untrustworthy software from entering your system in the future, you should keep security your software enabled. As long as it stays installed on your system, no untrustworthy applications could enter your system illegally ever again. Feel free to remove StreamingTime from your system if your browser’s settings have been changed without your permission. This is the only way to remove the undesirable page set too. Once it is gone, you could set a new search provider of your choice. Make sure it can be trusted fully! Access the browser’s menu (tap Alt+F) and select More tools. Locate the browser extension named StreamingTime. Next to the add-on, click Remove.